E3 2017: The Characters you should know about - Super. Black. Characters of Color at E3 2017! We here at Super. Black. love video games. Well, one of us does. Therefore, E3 time of year is my favorite time of year. While I am not able to play and finish as many games as I would like, I am steeping in video game culture. I find myself still excited for new gaming I.Ps and updates to beloved franchises. Here on Super. Black., we will cover all the multi-cultured characters being shown during the E3 gaming coverage. As this is a small operation, if we miss anyone, please feel free to connect with us on Twitter (@superblackorg) or head over to the contact page and drop us a line! Contract badass Nadine Ross is at it again. The standalone story from Uncharted 4 sees our resident evil-ish treasure hunter teaming up with fortune-loving Chloe Frazer for a fun-filled romp through India. The duo is in search of an artifact of some such importance, leading to hijinks and mayhem galore. *Sigh* That’s so Nadine right there. Mr. Miles Morales made his debut during the Sony Press Conference as a stinger on the final Marvel Spider-Man trailer. Miles wears the giant spider eyes in the Marvel Universe, operating as a (relatively) new Spider-Man. If we are gifted with the ability to play as the Miles Morales version of Spidey with all his unique abilities, it can only make that stunning game better. Looking forward to it! That is the description provided by Ubisoft on their official website. Based on the trailer presented during the Ubisoft conference, she operates as the getaway driver for all the nefarious hijinks Knox (the space money) get’s into. There wasn’t much to her character presented other than the fact that she chauffeurs an ape around. The big news is there is an actual Beyond Good & Evil 2! The depth-deprived pirate and former assassin Billie Lurk takes up the mantle of mystic ninja assassin in Dishonored: Death of the Outsider. Billy served as an NPC in last years Dishonored 2. Later this year, we get to control the once great assassin as she looks to kill what I can only assume is an already-dead guy. I really enjoy the offshoot story-telling video games embark on. Another example being Assassin’s Creed 4 Black Flag Freedom Cry. Having a different perspective on the world you once enjoyed as someone else is always a treat. This DLC will force me to play and finish my copy of Dishonored 2, which is sitting at the top of my “Please Play Me” pile of games. Ubisoft is looking to refresh the Assassin’s Creed franchise by taking the story as far back as ancient Egypt. Assassin’s Creed Origins drops us in the shoes (sandals?) of Bayek of Siwa, the last of the Medjay. With a voice like golden butter spun from the buttery-like web of Anansi and a deadly skillset, Bayak looks to join the ranks of Ratonhnhaké:ton (Assassin’s Creed 3) Adéwalé (Assassin’s Creed Black Flag) and Aveline de Grandpré (Assassin’s Creed 3 Liberation). While the Creed franchise has hit some franchise fatigue the past few entires, with this new structurally exotic setting, I have high hopes it will rekindle my enjoyment of the series. The stunning actress Janina Gavankar (Shivakamini Somakandarkram!!!) becomes commander of Inferno Squad, an Imperial special forces unit in Star Wars Battlefront 2. She officially becomes an integral part of the Star Wars universe, helping to bridge the gap between The Force Awakens and The Last Jedi. Janina was the brightest spot of the EA conference, bringing genuine enthusiasm, style and nerd love to the proceedings (she brought her momma with her for goodness sake, how sweet is that). With a brand new dedicated campaign in Battlefront 2, I will surely shell out some cash to run through that as Iden. Janina is a presence and able to hold her own on the acting field (does acting happen on a field?). I hope she brings the quasi-intensity from her E3 entrance to the Star Wars campaign. I wish we were buds. The man is a gyrating orb of muscle and energy. Having him in Crackdown 3 is nothing but a plus. Crackdown has always been a series that allowed you to create whatever type of agent you liked. It was a very versatile and open-ended game. I recall creating a very beefy bloke from Detroit (fan fiction territory) with a mohawk. He periodically gave the citizens of Pacific City a compact Sedan enema. 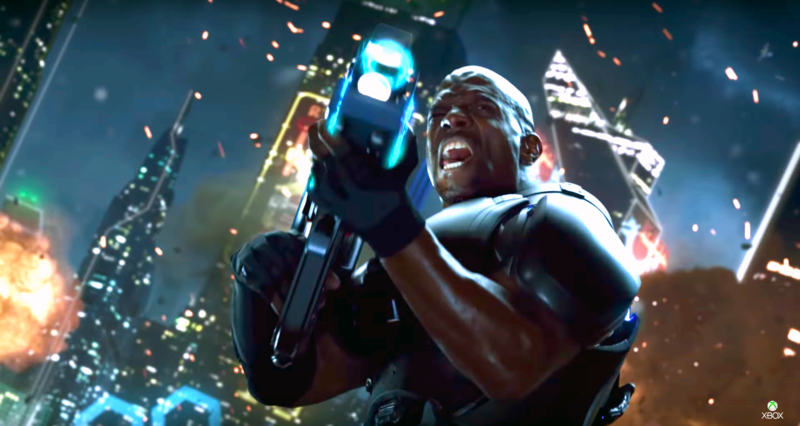 E3 2017 Crackdown 3 – Look at all those diverse faces! Bookmark this page for updates throughout E3! Join in on the fun and suggest characters to add to the list!